There's heightened nervousness about the next recession and there are signs pointing in both directions. I can't turn around without seeing or hearing people worrying more about the next recession. Google Trends: Web search for "next recession"
–Slower global growth, particularly in China (also Europe and Japan). Remember how Apple's market cap fell 10 percent in one day a couple of weeks ago. That was on the news that their China sales were down. We're all connected, man…also, trade war. –Higher interest rates and the flat yield curve. Interest rates are up, which acts like a brake on growth and they're up more for short- than long-term rates, meaning the yield curve is flat, though not inverted (inversions provide reliable recession warnings, though they don't say precisely when). –High levels of US sovereign and corporate debt could provoke a credit crisis. High private sector debt levels can proceed a deep and sudden credit contraction, and high government debt can lead to the perception of diminished fiscal space, discussed below. –Overheating risk and the Fed. This has maybe faded in recent weeks as the Fed has sounded pretty dovish of late, while inflation–actual and expected–looks decidedly nonthreatening. But with historically low unemployment and bigger-than-expected job gains, there's always some nervousness of the return of that 70s show, with inflation taking off and the Fed having to slam on the brakes. –Trumpian cray-cray. I mentioned the trade war. Then there's the shutdown. And…how can I say this?…our current leadership fails to inspire confidence in this (or any other) space. "I don't see a recession" in 2019, Powell said Thursday in an interview at the Economic Club of Washington, D.C. "The U.S. economy is solid. It has good momentum coming into this year." To be clear, the "solid U.S. economy" still leaves too many people and places behind, and real middle-wages, incomes and earnings haven't been nearly as strong as, say, corporate profitability. Just to be a contrarian, let me tell you about a few indicators that underscore Powell's near-term optimism. First, economist Jan Hatzius from Goldman Sachs has long emphasized the private sector balance sheet (those of us of a certain age recall that the great Keynesian economist Wynne Godley emphasized this metric). Jan writes that: "…a financial deficit in the private sector—i.e., an excess of private sector spending over private sector income—…makes aggregate demand highly vulnerable to disruptions in asset prices or the supply of credit." Well, private balance sheets look pretty good–they're around their historical average. 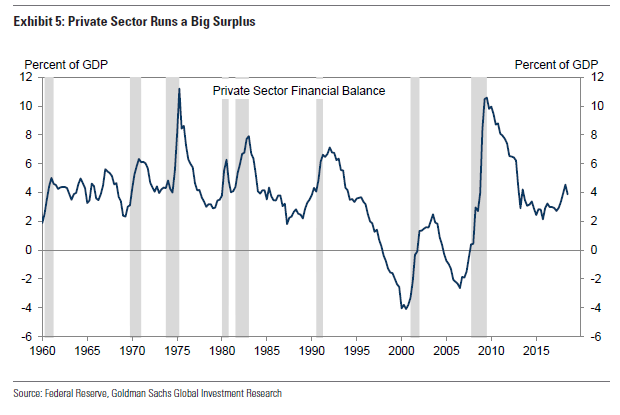 Hatzius calls this "an unusually benign reading this deep into an expansion" and adds that "it is not only the household sector that runs a surplus but also the nonfinancial corporate sector, which is reassuring given the concerns around leveraged loans and corporate credit more broadly." I agree. However, the figure does show that this balance can spike pretty quickly, so here's some positive indicators to which I'd give more weight: the strong labor market, rising real wages, and their correlation with real consumer spending. 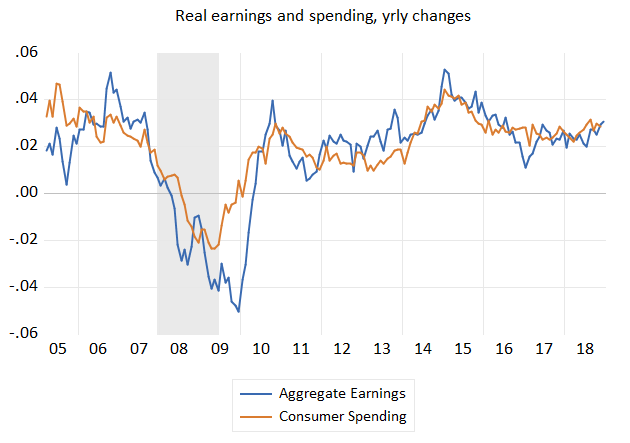 The figure below plots the yearly change in real aggregate earnings–real wage*jobs*hrs/wk–for middle-wage workers against consumer spending, which, ftr, is just under 70 percent of US GDP. To be fair, this is a much less forward looking indicator than say, the yield curve, but here's the punchline: unless you have a story about the US job market heading south in a big way this year, I don't think you have much of a near-term recession story. Moreover, my labor market story goes the other way. I suspect unemployment–a lagging indicator–falls further this year and that the combination of strong labor markets and low energy prices leads to decent real wage gains. In fact, just this AM, we learned the real, mid-level hourly wages rose 1.3 percent in 2018, its strongest showing since August 2016. To be clear, in much of my analysis, I have emphasized the expected slowing of growth later this year as fiscal stimulus fades. But, again, it's not obvious that this doesn't mean a return to the pre-stimulus trend growth rate of around 2 percent as opposed to a recession. Finally, while we just can't know when and why the next downturn will hit, we can get a sense of whether we're ready for it (listen to the Indicator link above on this question). I say we're not (though if we did the stuff in here, we could be). Monetary space may be constrained by an historically low federal funds rate, and if the debt/GDP level is =>80 percent, which may well be the case, history shows that the fiscal authorities, politically constrained by this higher-than-average debt level, tend to do less by way of discretionary, counter-cyclical offsets. Such austerity would be a terrible mistake, for a lot of reasons. Depending on the depth of the downturn, it's a great way to consign millions of people and families to unnecessary job and income losses. And such losses, depending on how deep they are, have been shown to leave lasting scars on people well into their post-recession lives. Also, as I wrote yesterday, Blanchard's new work shows the fiscal and welfare costs of public debt to be far below where the convention debate places them (and in my framework, countercyclical offsets in recession are definitely GD–read the piece). I'll continue to heed all the warnings of my fellow tradesmen and women–no question, there are headwinds now that were not upon the land a year ago. But I'll be more guided by the fact that nobody can time a recession, while anyone who's paying attention can raise trenchant warnings about whether we're ready for it, wherever it is.